Sunday 23 August marked European Day of Remembrance for Victims of all totalitarian and authoritarian regimes and of particular interest are the events marking remembrance for victims of Communist crimes as victims of Nazi and Fascist regimes have duly been and are rightfully always remembered at all time and regular events ever since WWII. While there were numerous events held at various mass graves, pits and communist jails in Croatia, the citizen action group “Circle for the Square” (Square referring to Marshal Tito Square in capital Zagreb people want renamed as Tito is placed among top ten mass murderers of the 20th century world), a civil initiative for a Croatia without totalitarian symbols in public spaces, said on Sunday that Croatia showed no determination to condemn communist crimes but glorified those most responsible for committing them. 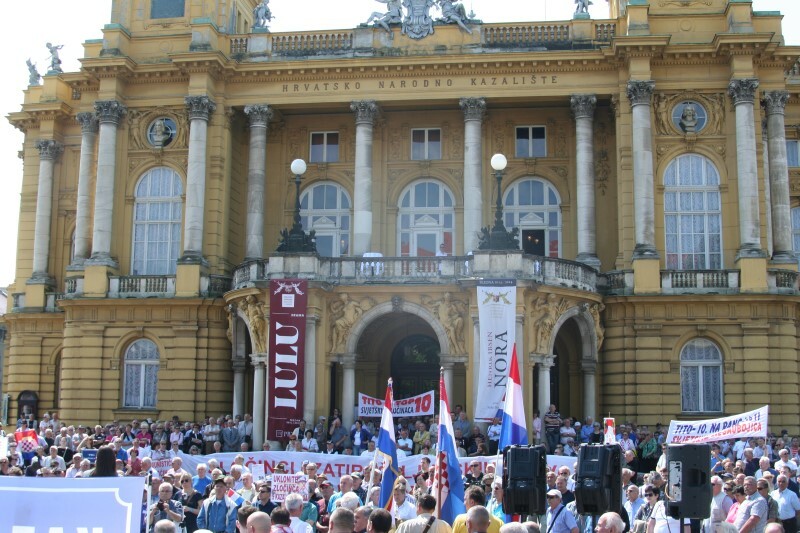 A a good number of people from the public and about a dozen members of the initiative, carrying banners against Tito, rallied in Marshall Tito Square in downtown Zagreb for the ninth straight year, unsuccessfully urging the City Assembly to rename the square. 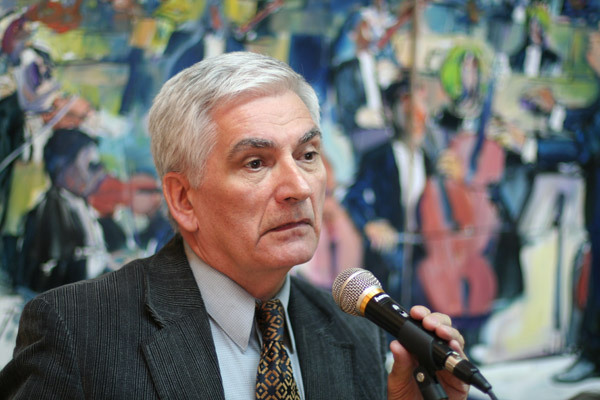 Activist Ante Beljo said the European Parliament Resolution on European conscience and totalitarianism was adopted six years ago and the one by the Council of Europe condemning communist crimes even before. The European declarations say that political parties and institutions cannot decide on the victims and the remembrance for them, but their descendants and those who were endangered during communism, fascism or Nazism, he said. He said the Croatian budget financed institutions such as the Documenta Centre for Dealing with the Past, which he said spread untruths about the Croatian people. “Recently, since the Operation Storm anniversary, we have been witness to so much pressure on Croatia and the spreading of untruths created over 70 years of the Yugoslav totalitarian system. This is happening again so that our country could remain under the complex of guilt and lies which have been spread around the world for years – that the Croatian people is genocidal and that it should not have its state. 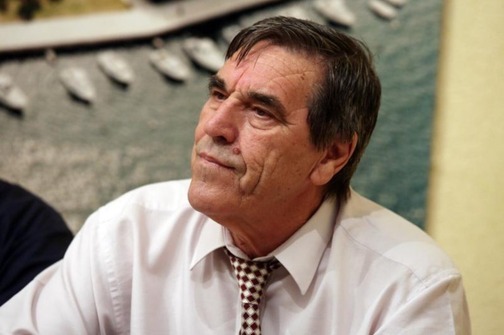 The victims are the best proof of what Croats fought for,” Beljo said. 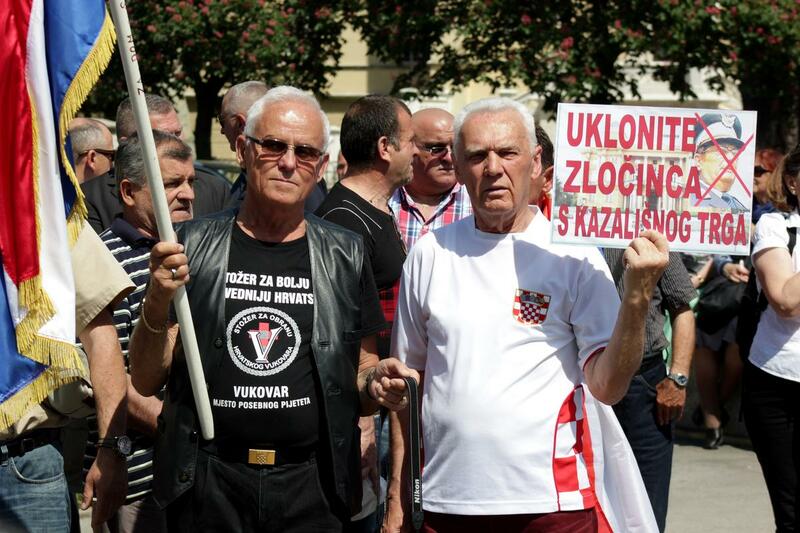 Croatia’s former communists who wrongfully call themselves antifascists are the ones who keep symbols of the Yugoslav communist regime alive in the positive light and have not contributed anything towards the condemnation of communist crimes or to prosecuting those held responsible; indeed they try and cover up the crimes at every turn. The European Day of Remembrance for Victims of all totalitarian and authoritarian regimes this year saw a large number of commemorative ceremonies at multitudes of mass graves and pits across Croatia filled with the remains of thousands of innocent people murdered and tortured by the communist regime but the one that caught my eye the most was the one in the town of Vodice (north of Split and Sibenik coast) because the first monument to victims of Yugoslav communism in a public place ever raised and unveiled in Croatia actually occurred there last Sunday! The monument was raised under the auspices of the Town of Vodice and association Croatian Home Guard of the Sibenik-Knin county. This event heralds a positive future for Croatian democracy based on condemnation and rejection of all totalitarian and authoritarian regimes of the past. This was what Croatia fought for in the 1990’s and communism just wouldn’t die; it needed and still needs a strong push into extinction. 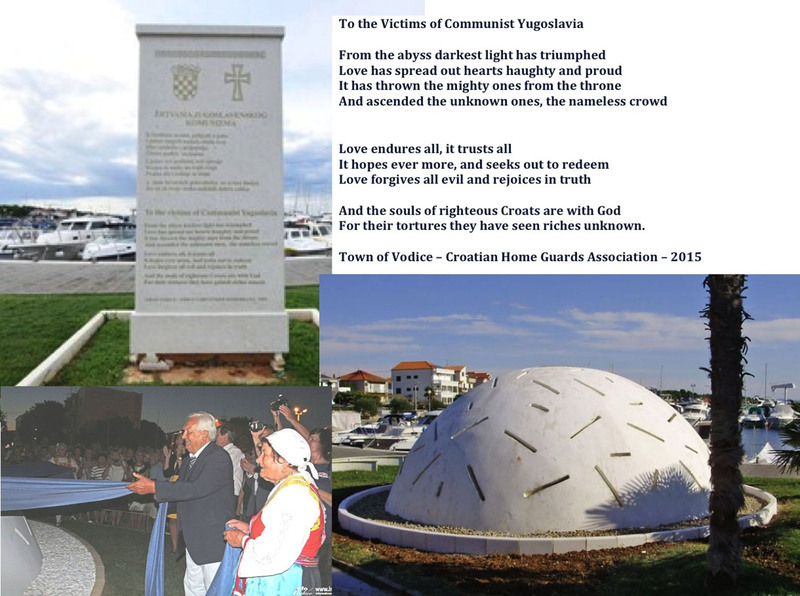 The monument at Vodice is artwork by the distinguished academic Croatian artist Kazimir Hraste, the unveiling mass and prayer were offered by Bishop Ante Ivas of Sibenik and the honour of the unveiling this very important monument was given to Dr. Zvonimir Separivic, president of the Croatian Victimology Society. Calling upon Cardinal Aloysius Stepinac’s words, Dr. Separovic reminded us all how Croatia had been a victim of big evils. 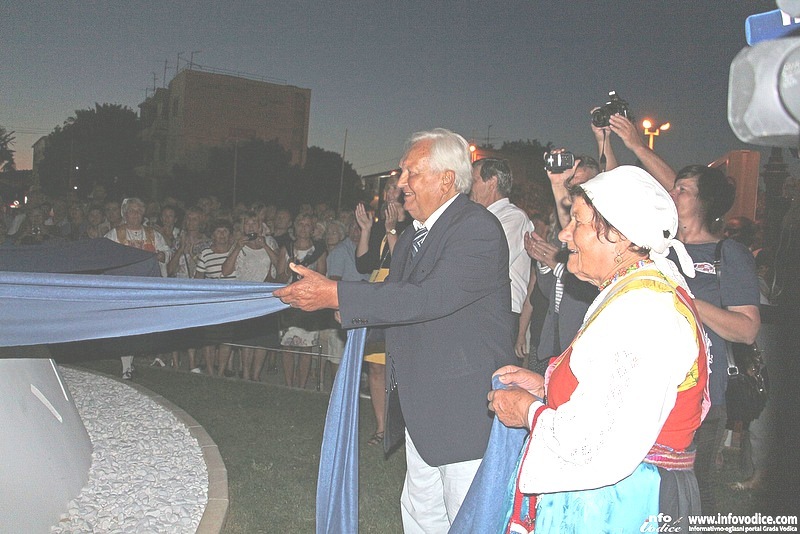 At the unveiling, Nikola Spanja, president of the Home Guard Association of Sibenik-Knin County said that the town of Vodice has given its permanent contribution to eternal remembrance of victims of communism and that according to known data there were 153 persons murdered by the regime from Vodice area in post-WWII years. “Lasting is that remembrance of victims of Golubinka, Hudina pit, Bleiburg and all other known and unknown places of mass murder. 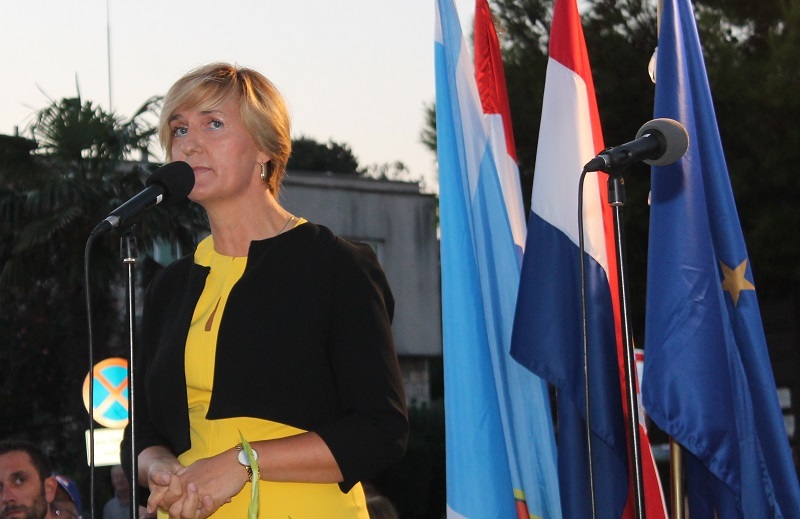 This monument is dedicated to the victims from Vodice whose basic human rights were denied – the right to life and human dignity – and victims over whom terrible crimes and sins were committed,” said Spanja. 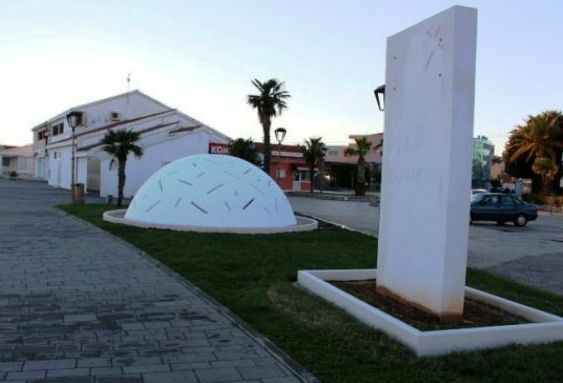 It wouldn’t surprise me one bit if the Croatian antifascist riffraff started protesting against this monument in Vodice, seeking it comes down. They are very afraid that new ones might start coming up in other towns and they want to bury the criminal communist history. Monuments to the victims of oppression whether communist or not should be erected wherever mass murder was committed as a reminder that things like this should never be allowed to happen again. In a democracy, the renaming of a place to avoid glorification of the perpetrators of such crimes should be put to the vote of the people.In this case, if the followers of Tito are in a minority then their wishes needs must be overridden by the needs of those who lost family and friends to his oppression. The decision must rest with the people of Zagreb and those who are the Government elect of the area must abide by that decision even if they don’t agree with it. I was there a week ago. I was very pleasently surprised to see the monument while taking an evening stroll with my wife. I imediately took my camera out & snapped an image of the inscription on the monument. I did not expect to see this in Vodice. Za Dom Spremni Hrvatska. That’s nice to hear Stipo, and I love the words from the monument. Well written Ina. 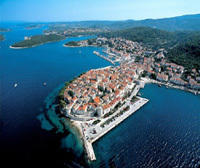 They should defintely change the name of tito square! As an EU member State, I believe Croatia must remove any street named after Tito and if this is true, then why aren’t we doing just that? My father was a victim of the Yugo communist state. When my father was 10 years old, he had to witness his mother and his Godmother get tied to a tree and machine gunned to death by the Yugoslav government and both were buried in mass graves and their bodies never identified. My father was the oldest of 4 children so life for him wasn’t easy. When he was 18 years old, he and a friend carried a Cross through his town near Imotski on Good Friday after the local communist authority banned the practice and because of this they spend 6 months in prison. The following year, the Communists allowed for the Cross to be carried but they insisted on carrying it. My dad and the same friend took the cross from the man and told him that those that don’t believe should not be carrying the Cross, for that, they spent another 6 months in prison. Another of my father’s friends named ivan Gabelica was tortured in a Yugoslav Prison where he was beaten, had steel doors slammed on his arms, and was hung in the air by his arms which were tied behind his back for 11 hours at a time and to this day if he doesn’t have enough sleep, he has flashbacks of that torture. I remember as a child, my grandmother on my mothers side got sick and my mom wanted to go see her because she didn’t know if she would make it (she did get better). I remember my mom and I having to go to the Yugo embassy and having to ask for a visa which we were denied. They had pictures of us at the Croatian Church, at the Croatian picnics, and they knew that I played soccer for the Croatian soccer team or to them, “Ustaska crkva,” “Ustaski Piknik na Ustasku Zemlju,” and “Ustaski nogometni klub,” it was pathetic. Knowing that we were denied the visa, while we were sitting at the table, I pointed to a picture on the wall and ask my mom who the old man in the picture was. The Yugo embassy worker started chastising my mom and got angry with here and asked her why she didn’t teach me who that man was. I then turned to the guy and told him, oh they did teach me who that was and I just remember that he was the man who murdered 500,000 Croatians in Bleiberg and the Krizni Put. The man flipped and kicked us out of the embassy. My point is, this is just a small example of what my family went through but we’re just one story of thousands and thousands of others who went through similar ordeals. Nice to see. But even nicer to see would be taking down that massive eyesore down the street. 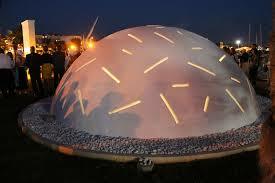 Namely the partizan monument dominating the main square in Vodice, reminiscent of the ‘jasenovac flower’. 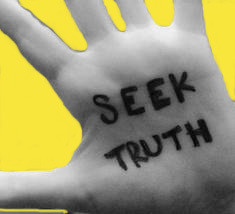 The truth always prevails. History always has a way to deal with wicked leaders who bring pain to fellow humans. If we are doing the monuments for communist crimes, then there should be one for the victims of NDH (Nazi puppet state) to be fair. All crimes should be treated the same. But monuments to victims of WWII NDH have been erected decades ago, Jasenovac for one but then again it would seem you are one of the half-blind people who do not see these because of bias. And yes, precisely my point: all crimes should be treated equally and that’s why this first monument to communist crimes is so important as those have not been allowed during Yugoslavia life.